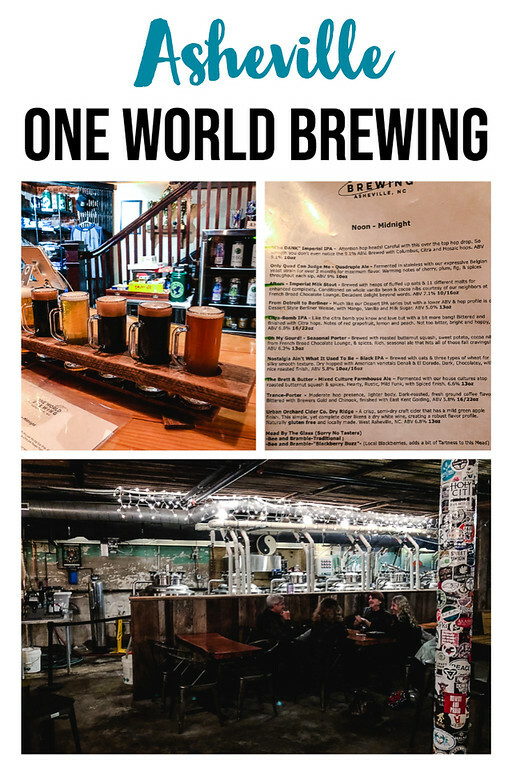 One World Brewing is a great brewery in downtown Asheville. It has a good selection of tasty craft beer and a fun, casual atmosphere. 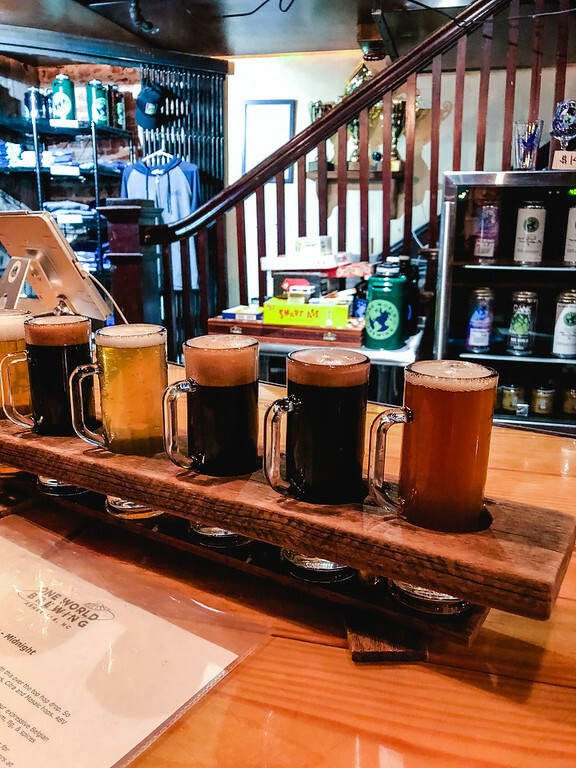 It’s no secret that we went to Asheville to primarily visit the breweries. It was going to be cold and rainy, so we wouldn’t be doing any hiking. Luckily there were plenty of breweries within walking distance of our hotel: we walked to Wicked Weed Brewing, Burial Beer and Green Man Brewing. We saw that One World Brewing and Lexington Avenue Brewing were also within walking distance, though a little bit further and in the opposite direction of the others. So, we set out to explore them both along with East Fork Pottery. Unfortunately, since then Lexington Avenue Brewery closed down after being bought by another company. 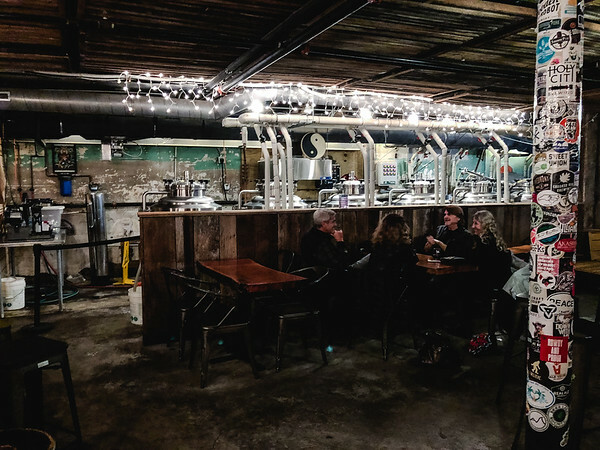 The first thing you notice when you go to One World Brewing is that it’s down a sort of little alleyway and then you go down some stairs. It reminded me of bars that I used to go to in college. It was dark with a concrete floor, funky decor with stickers plastered on the poles and the brewing equipment along one wall. There is a bar at one end and some tables set up by the brewery equipment. We were greeted right away and handed a list of beers. 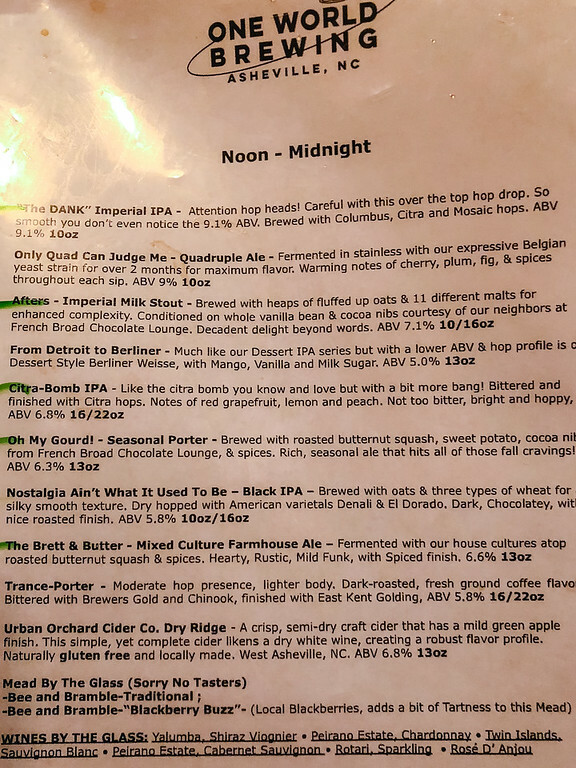 There were nine beers to choose from and one cider. There were IPA’s, Stouts, Ales and Porters. They all sounded interesting and we went for a mix with: The Brett & Butter, My Gourd! – a Seasonal Porter, Citra-Bomb IPA, The Dank and Imperial IPA and Imperial Milk Stout. The came in these cute mugs that seemed to be more generous than most flights. We really enjoyed all of the beers. We love a good hoppy beer and the “Dank” Imperial IPA did not disappoint! With plenty of hoppy flavor and an ABV of 9.1% The Citra Bomb IPA was also good with plenty of citrus notes and an ABV of 6.8 – making it more drinkable for me! The Brett & Butter was good, but not my favorite. The beauty of craft breweries is that you never know what you are going to get. It’s constantly changing, so it makes sense to visit them often, so we will definitely visit One World Brewing again. I just checked their website and the current beers on tap are: Hempin Aint Easy, Saison of Love, Soft Opening, Pick Yourself Up and Chai Again, We Belong in the Frontier, Single SIPA, Forever Zedoray, Old Town Amber and Pour Yourself a Cup of Ambition. Don’t those sound good!! I can’t wait to go back!